Surprise Dinner–Make mealtime a fun mystery! Here are my boys filling out their menus. I love this idea because it’s a way to make an occasion special and fun without really spending any extra money—something many of us are looking for these days. When we were kids, my mom would periodically put on a “Surprise Dinner” for us. I’m pretty sure this wasn’t her original idea and that others of you have probably done similar dinners, but I actually haven’t seen it anywhere else. The basic premise of a Surprise Dinner is that you order your dinner in courses, but the food all has different names, so you really don’t know what you’re going to get and when. Kendra has indicated in previous posts how incredible our mom is and these dinners were no exception. She’d have anywhere from 20 to 30 different items, including a main dish, bread, butter, various fruits and veggies, a few small desert items, the utensils, drink, napkin, toothpick, and even an ice cube. She’d usually enlist one of my older sisters to help her, then she’d hang a sheet to cover the kitchen entry so the meal could really be a surprise. and “Son of Noah” (ham). Beneath the menu were squares for each course. We’d write our names in each and fill in our orders, choosing 5-6 items per course. Then Mom and her helper would serve the meal. In later years, my mom added a list of “rules” to the menu. These included no talking while ordering, ordering each item only once, and you can’t save anything from one course to the next. A few things to keep in mind if you decide to throw a surprise dinner. Your kitchen will be a mess as it’s taken over by 20 or so different dishes. Dinner will take considerably longer than usual, but that’s often a really good thing. When serving the dishes, serve a small amount of each, because you don’t want your guests (especially the small ones) filling up halfway through dinner. Rules of etiquette definitely don’t apply, so just have fun. We did a mini Surprise Dinner for our Cub Scout Blue and Gold Banquet this year (I’m Cubmaster—with 4 sons it was inevitable). The theme was “American ABC’s” so we ended up with a 9-item menu (we scaled it down since we were serving several dozen people), made up of state names. 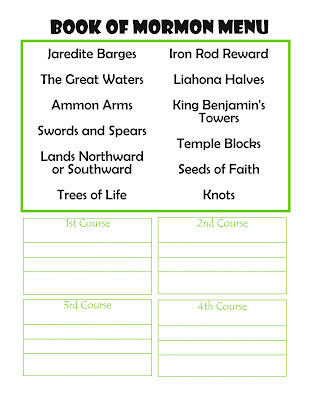 Each table had two “menus” and each person had a little 3-page booklet—one page for each course—that they filled out. For example, for their first course a Cub Scout could order Nebraska, Massachusetts, and Washington and end up with corn, mini Boston cream pie and a few apple slices. 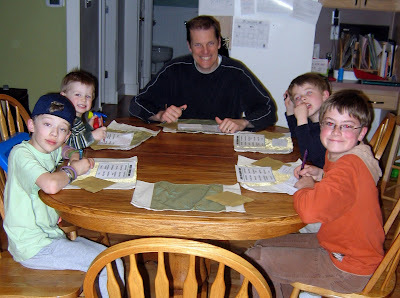 I found a simpler version (where you actually get to sit and eat WITH your family) at the Family Fun website (at least I’m pretty sure that’s where I found it, but after some pretty extensive searching, I can’t find the link for it now. . . sorry). In this version you write the names of all the food on strips of paper (their real names) and put them in a cup for each family member (I made my kids do this while I was fixing dinner—good handwriting practice, right?). Then for each “course,” everyone draws 3-4 strips out of their cup, and that’s what they get. When we did this for April Fool’s Day, the kids got a big kick out of seeing me eat my mashed potatoes without any utensils (luckily I hadn’t drawn gravy or it could have gotten really messy). I haven’t done it, but I think the Surprise Dinner would be great for a (smallish) Halloween Party. Just think of all the spooky/gross names you could come up with for the different food. Such a cute idea. My mom’s Sunday School class once did something like this at Valentine’s Day. The only thing I can remember was Cupid’s Arrow which was a knife.. I was searching for a fun dinner idea to celebrate our family finishing the Book of Mormon, this is perfect, thanks. I did try to pin it on pinterest, but couldn’t get it to work.